There’s a patch of road that I have to drive over on my way to work every day that is horribly messed up. It’s one of those areas that they keep patching over and over. I think I shave a few days off of the lifespan of my car’s suspension every time I have to drive through it. I don’t know if there was a problem with the way that section of the road was constructed or if the military were using it to do some explosives testing. Sorry to say it, Chris, but i don’t think this one is too great. I do like the military testing thing. They must use all the parking lots over at the strip mall here in town for the same thing. Never knew y they were so messed up before. Thanks for the answer. Also, first post! and your biff’s lucky that it’s just a crack not an active volcano that has formed. Why is Biff in the crack? Over by where I work there used to be a road that was just impeccable. Just two weeks ago they FINALLY started to fix it. By monday they had it all paved. Now it just needs the lines…. Is that a Pontiac Vibe / Toyota Matrix? When I grew up, snowmelt water would go under the highway and freeze. The pavement would swell from the forned ice. Yeah, it’s a Pontiac Vibe. definitely a vibe. hey chris, are you a member of genvibe or matrixowners? In reply to the question of why he’s in the crack; at first I thought he hit the crack(or there was an earthquake) and flew out of the car, but I now think a more likely explanation is that he has also now realized he needs to watch his step while walking out to his car. Whoa, whoa… Biff… Biff has a car?? @ Ela: yes, he tried to parallel park it at the speed of light, remember? 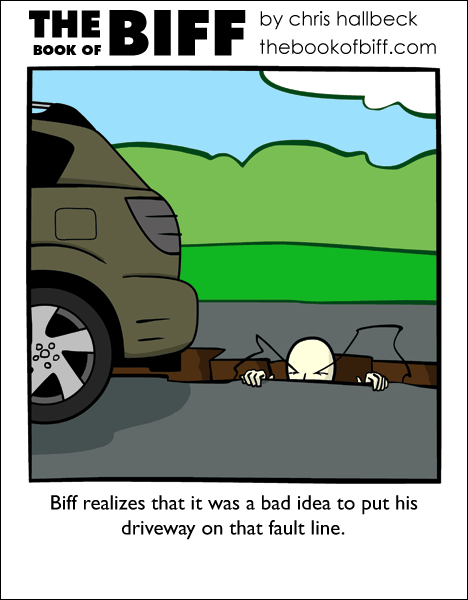 Biff finally gets a driveway for all his cars, only to find out it wasn’t an ideal spot. Mother Nature can be cruel and sadistic. I dealt with a 7.3 earthquake in 2001. I was calm and everyone else was panicking. Luckily, no one died due to the depth of earthquake. Is this the start of car week? I assume that the house was relatively cheap. There’s a section of the I-5 in the mountains like that. It’s pretty much a half-mile strip of potholes that are perfectly aligned to wherever your wheels are going to be no matter what. The worst part is that because it’s in the mountains, no one’s ever going to fix it. At least it wasnt a hole to the middle of the earth like mine has. Here in the Seattle area the politicians decided it was a great idea to build a sewage treatment plant on a major fault line. And this is after years of studies saying that fault line is overdue for a major earthquake. oh my freaking god, is that even POSSIBLE? !